For acclaimed Australian guitarist, arranger, and conductor Scott Borg, this CD represented a voyage into the unknown. A journey filled with joy, inspiration and surprise. The one constant was his instrument. Each piece on this CD is an homage to his mentors, demonstrating the evolution of his musicianship. On an Overgrown Path alludes to a Moravian wedding song, in which a bride observes wistfully that �the path to my mother�s has become overgrown with clover�. The poignant nostalgia expressed by these words reflects the mood of Janacek's cycle, in which he conveys a series of memories, both tender and tragic, his luscious harmonies and floating melodies creating an idealistic view of a bygone world. Tippett�s The Blue Guitar is a monumental and hugely important contribution to the guitar repertoire. The three movements convey three �moods or gestures�: �Transforming�, �Juggling�, and �Dreaming�. To reflect both the title and the guitar�s own musical history, Tippett weaves blues-inflected harmonies into the fabric of the music. 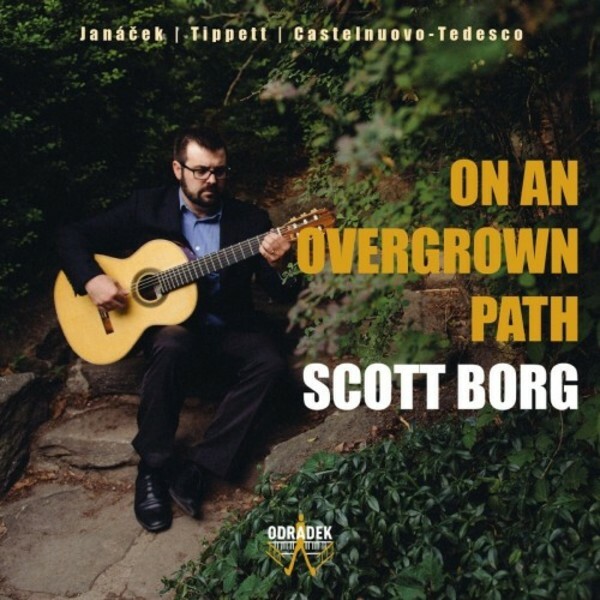 When Scott Borg asked fellow guitarist Eliot Fisk, �What is the most insane Castelnuovo-Tedesco piece you have ever played?�, he replied without hesitation, �Suite!� Scott Borg takes up the challenge on this CD, relishing the work�s twists and turns and dazzling virtuosity. Praised for his �enormous facility on the guitar, a fluent technique... with total confidence and professional expertise, panache and artful spontaneity�, Scott Borg has become renowned for his refined and daring performances. As a winner of the Artists International competition, the New York Concert Review described Borg�s Carnegie Hall debut as �well balanced, gracefully presented, and expertly played� each note was purposeful and focused, as was each rest�.